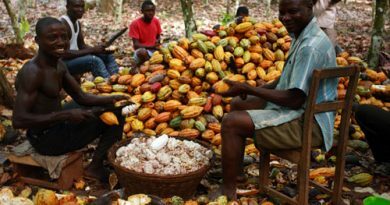 Interestingly, the accounts, as narrated to the ONEGHANA team indicates that Tetteh Quarshie actually smuggled eleven pods of cocoa (not beans), hidden in his tool box across borders and oceans into Ghana. The euphoria and frenzy that have always characterized the celebrations of the Easter Monday had drawn lovers of pleasure to various entertainment destinations across the length and breadth of the country. In fact, the whole nation metamorphosed into one whole big ball of fiesta-the beaches, popular drinking bars,night clubs and even churches had their share. However, the ONEGHANA crew, led by the ace reggae presenter and an advocate for clean environment of Yfm,Black Santino, rounded up the festivities with a trip to Tetteh Quarshie’s First Cocoa Farm, located at Akwapim Mampong, in the Eastern Region of Ghana. 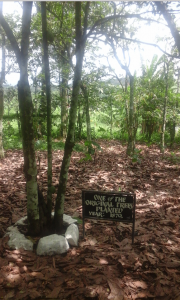 This farm, according to information gathered, inhabited the very first original cocoa trees transplanted from the cocoa beans/seedlings the man Tetteh Quarshie smuggled from Fernando Po in 1876. 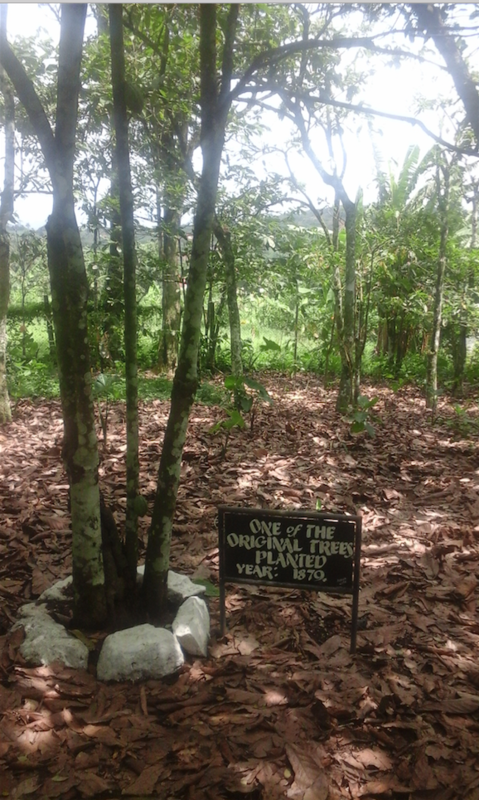 This cocoa tree is 137 years old. The very first Tetteh Quarshie planted in 1879. Though serene, the total ambiance of the 0.38 acre farm, planted in 1879, does not only depict an object of neglect but a seeming departure from the colourful and monumental discovery that adorn most tourist attractions in the country. The most shocking bit- the building that housed the monuments and the artifacts belonging to the farm have been under lock and key for the past eight years. In fact, upon entering, the visitor is greeted with just a portrait of Tetteh Quarshie hanging in the visitor’s lounge and nothing else about the man who gave this country its economic freedom! 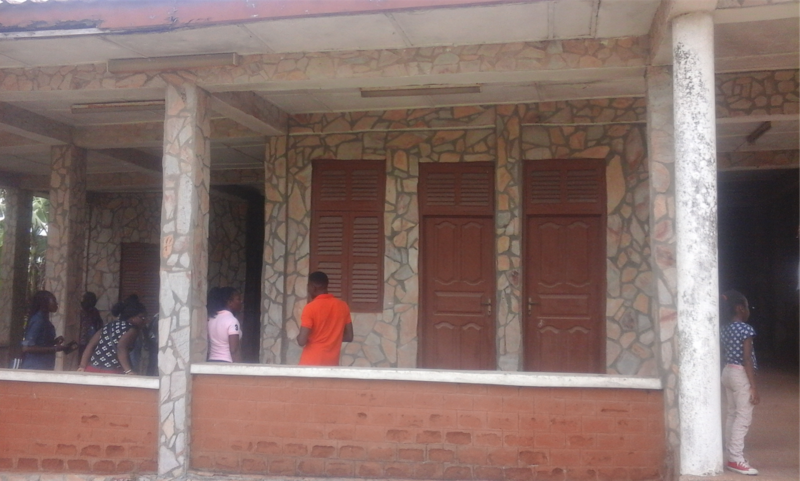 One of the most intriguing revelations that came up during the visit, had to do with the factual inaccuracies in how Tetteh Quarshie is historically documented and presented. 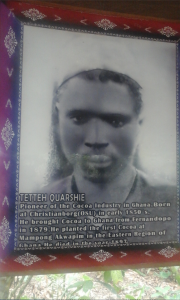 Various history lessons from the basic to the highest level of education in Ghana has it that, in his quest to pioneer the cultivation of cocoa in the then Gold Coast, Tetteh Quarshie SWALLOWED pills of cocoa beans for fear of being caught transporting them across the borders of Fernando Po (now Equatorial Guinea) since it was illegal to do so. 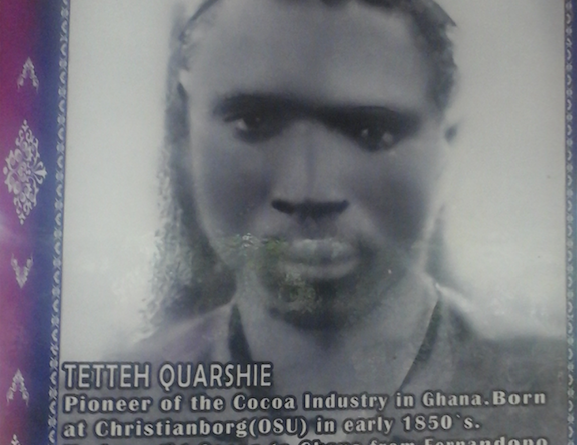 Born in the early 1850’s at Christianborg (now Osu), young Tetteh Quarshie, a skilled blacksmith was adopted by the Basel Mission as an artisan. His exploits with the missionary group took him to the Akwapim area and eventually beyond borders to the country into places like Fernando Po. 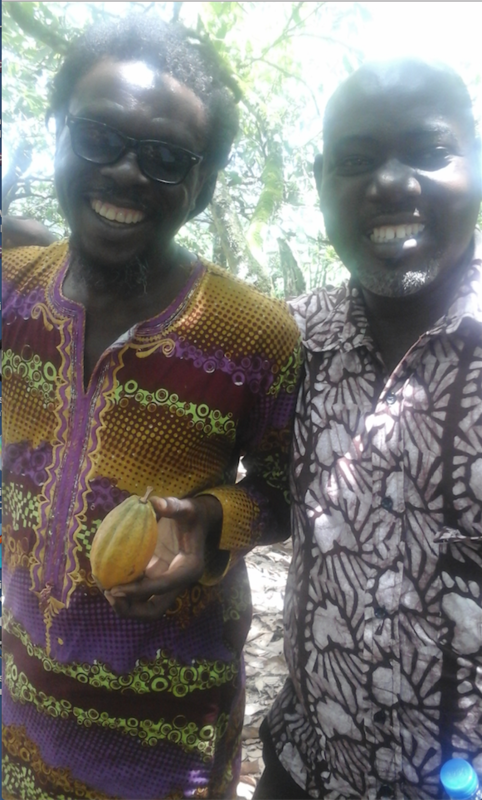 After a brief sojourn in that country he realized the commercial viability of cocoa, which was a major commercial commodity. However, transporting it openly across the borders of that country constituted a crime, so he decided to smuggle the eleven pods, hidden under his tools box on his return home. The journey from Fernando Po to the Gold Coast was mostly on the high seas at the time, lasting at least six weeks and more. Front view of building containing the farm’s monuments. If Tetteh Quarshie had swallowed the cocoa beans ( as we are being made to believe ), logically, would the beans had still stuck in his bowels after a six-week-long journey? Food for thought! History is the foundation of every society; once we get it wrong, we misdirect posterity. 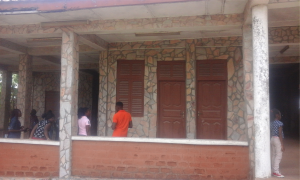 This is a humble plea to the Tourism Culture and Creative Art Ministry to save Tetteh Quarshie’s legacy. ← Insults, False Claims Dominated Political Discourse In Ghana’s 2012 Elections Will 2016 De Different?